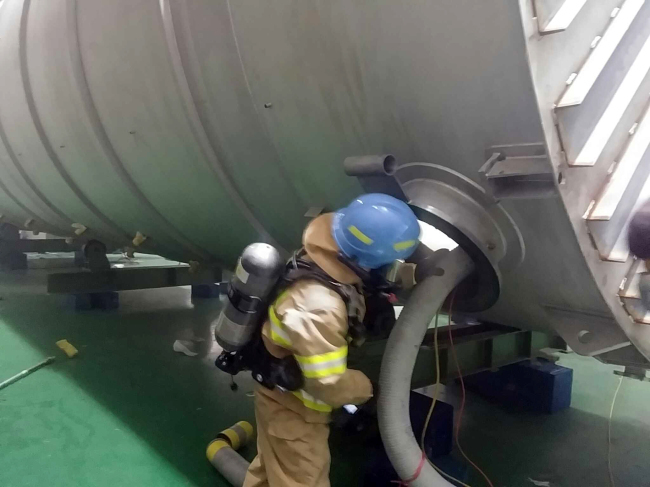 An explosion occurred at a chemical plant in eastern South Korea on Saturday, killing two Vietnamese and injuring two other Vietnamese workers, a fire official said. The accident took place at around 9:45 a.m., sending out plumes of black smoke from in the plant of the Foosung Precision Industry Co., which makes fluoropolymer lined tanks, pipes and valves. A worker in his 20s suffered third-degree burns to his face, while the other surviving worker in his 30s had second-degree burns to his legs and a broken left leg, the fire official said by phone from Wonju, a city located about 130 kilometers east of Seoul. The injured workers were rushed to the Wonju Severance Christian Hospital for treatment, while the two dead were taken to Wonju Medical Center, she said. The fire official said it remains unclear what caused the accident. Police officials were not immediately reached for comment.